Camp Kuzuma is the latest addition to the bouquet of hotels, lodges and safaris in the Chobe area. 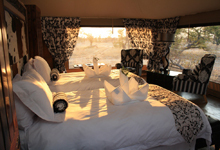 Aimed at the safari traveller wishing to avoid the crowds, it is a small camp with very comfortable finishes. An ideal camp to join onto a visit to the Victoria Falls or and extended safari into the Okavango Delta. Read more about Camp Kuzuma here.